Pastor's Appreciation Day is an annual celebration at the Ozaukee Christian School in Saukville, Wisconsin. 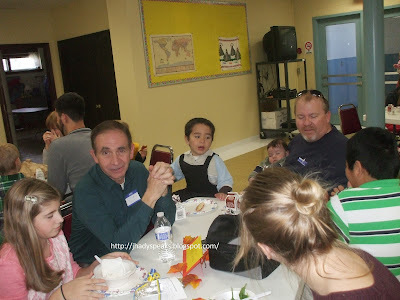 So, on November 13, 2013 Pastors from different Christians churches in Ozaukee County gathered to have lunch, prayer, fellowship and meet the OCS students. Pastors who's church member's kids attend OCS. Our church Pastor was there because my two older kids attend OCS for almost 2 years now. It was a wonderful opportunity to have lunch with him. That day too, my husband came home and surprised me after being gone for few days driving a truck to different states. I was the lunch mom that day so my whole family was there too. After lunch, the children had a little presentation for them. They sung songs and gave their testimonies of how the school impacted their lives. There were games and giving away of prizes too. At the end of the program, the children prayed for each of their Pastors. In the picture, my older son, Shem is praying while my other son Shawn lifts his hand. Overall, it was a wonderful day where God was glorified and people were sanctified. It's nice to appreciate the pastors too for their contribution to the community. Awww looks like a happy celebration! It's nice that the pastor is being recognized. It's nice to know that you're giving the chance to appreciate your belief advisers. I'm sure a lot came in to appreciate all the help the pastors have given them. I bet the pastor appreciates it so much. It's great that the kids are involved in this kind of activities. Not only good for the pastors but for the kids as well, for they learn the value of appreciation. that's an awesome way to appreciate your church pastor indeed.